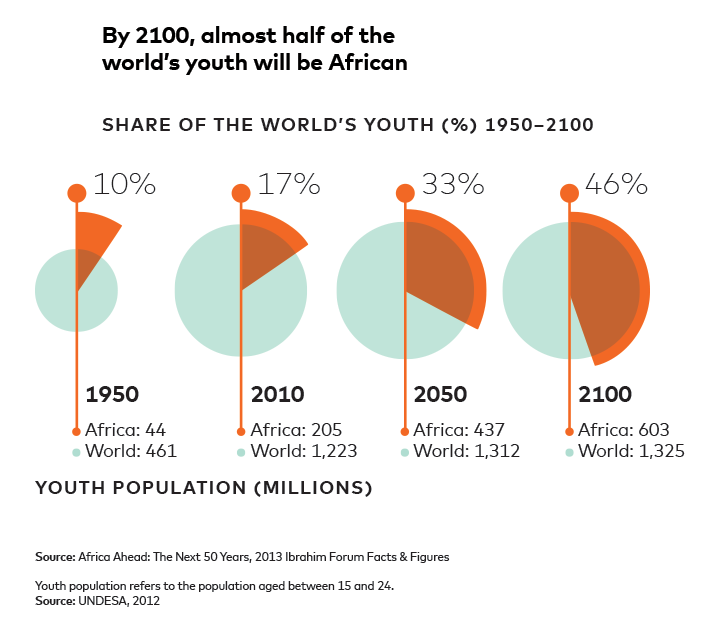 These issues can blur Africa’s potential. But it is precisely the quantity and depth of these challenges that enable African entrepreneurs to appreciate problems and inefficiencies in a way that's not possible when the challenges are not so serious. Leveraging the power of emerging exponential and digital technologies, African entrepreneurs are now living through an unusual time, in which the capacity of technology to solve problems is starting to match the scale of these market challenges. This is what gives African entrepreneurs an advantage. We can look back at these limited, "good enough" historical solutions, and we can see their deficiencies and inefficiencies. Africa is in a position to solve its challenges using exponential technologies, and in doing so, it can leapfrog what exists in countries with higher GNI. The African context provides the most fertile ground in which to innovate, because it is where these problems are most deeply felt, and are big enough both to motivate investment and recover the cost of that investment. And because today's solutions will use exponential technologies, African entrepreneurs can take those innovations to places around the world where the problem may be relatively smaller, but where valuable efficiencies could still be generated, using their ready-built and ready-to-scale solution. Here are some African companies already proving this. Companies in higher GNI countries are facing the same equipment challenges and cost pressures in connecting devices at the edge. Accordingly, IoT.nxt is positioned within the global IoT landscape, with growing interest coming from the US and Germany. Dell is also now preinstalling IoT.nxt’s technology into their gateways as an "IoT in a box" solution. With all the excitement around data analytics, delivering business value often gets lost. Dataprophet has carved out a niche in artificial intelligence for the manufacturing and automotive industries. A general lack of technical skills in South Africa means the country’s factories and automotive industries can find it hard to hire suitably qualified staff - unlike in Europe, for example, where better schooling and generational knowledge transfer to young people translate into the required industry skills. This skills gap has led to high defects and poor quality of output in South Africa’s manufacturing and automotive industries, generating raised costs and diluted investment value. Chronic food insecurity is a pertinent issue in Africa, where there will be 1.3 billion more people to feed by 2050. Aerobotics have built an analytics platform - probably the biggest in the world of analyzed plants and crops - to help address this challenge. Farmers in developing countries are often not highly skilled; have weak access to information, finance and insurance; and can struggle to grow beyond subsistence farming. The main barrier to growth is a paucity of data about their land, farming practices and raw materials. These three examples illustrate the same pattern of innovation: build the solution where the customer friction is the highest, because there you can solve a real and crippling problem with a stronger business case. Once built, the solution can be evolved and exported to higher GNI markets. African entrepreneurs can use their heightened imagination and "experiential wisdom" to create solutions for problems that are not, at least initially, as noticed or as high priority in higher GNI countries. This "noticeability" keeps African entrepreneurs ahead of the curve. Given the nature of exponential technologies, the solutions can then be used to disrupt other markets. This dynamic puts Africa in a more progressive position in the global economy, and will be key in driving a bi-directional, mutually beneficial approach to globalization on the continent.